What Is A Kit Lens and Why You Need It As A Beginner? What is a Kit Lens and Why You Need It? If you have just started out with photography, you must have come across the term kit lens and must be wondering what is a kit lens? A kit lens refers to the 18-55 mm lens that comes bundled with a camera. It is for this reason that beginners use kit lenses pretty often when trying to improve their photography skills. So, if you’re into photography, read through this article as we will get to know kit lenses in detail. What is a Kit Lens and What Makes it Different from Other Lenses? Basically, any lens that comes bundled with a camera is called a kit lens. However, as noted above, people mostly mean the 18-55 mm lens when they say kit lens. That is because it is the most commonly used and it is affordable. Obviously, it is made cheaply so you cannot expect the quality to be great, but for beginners, this is more than enough. You will not be getting high-quality photos with this, but it will provide a way for you to get used to using a DSLR. Nonetheless, when shopping for a DSLR, you will find some models that come bundled with high-quality lenses that can produce professional quality images. They are technically kit lenses as well. Why are Kit Lenses Called Starter Lenses? 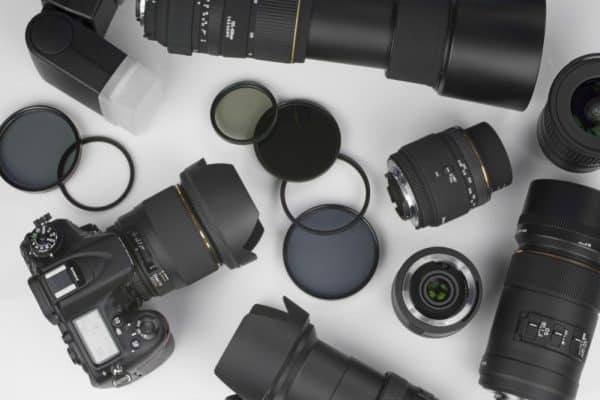 Kit lenses are considered starter lenses because of a few reasons. The first reason is that they come with your (first) camera, so in most instances, these are the first lenses anyone ever uses. Kit lenses also have a variable aperture. To put it in simple words, how wide the aperture can open is directly related to how zoomed in the lens is. If the zoomed in subject is at a far distance, the aperture is wider and if the subject is zoomed in is near the photographer, the aperture closes. This can be somewhat confusing for someone who is just beginning to learn photography and camera settings and features. Take note though that other lenses will be different from this and will not have a “variable aperture phenomenon.” So, you will have to take this thing into account as long as you are using a kit lens to take photos. Kit lenses are not that sharp, so the end result would not be crisp and clean like a professional image. They are made from plastic instead of metal like those of the expensive, high-end lenses. This is why they are cheap, and they are deliberately made this way by manufacturers because there is so much competition, so they try to keep their camera’s price down by using inexpensive plastic materials. Although they are not that great in terms of quality, that does not mean they will fall apart immediately. You can still take photos and use it adequately. In short, it will not be able to withstand prolonged use as it is not designed to be durable. Why is a Kit Lens Great for Beginners? Just because it is inexpensive and does not take high-resolution images does not mean it is useless. In fact, it is great for starting photographers since this can be the tool that can teach you how to take good photos. You can learn how to use the camera and the lens, as well as how to use your subject to get great photos. Remember, any good photographer makes the best of what they have. Think of the kit lens as a two-in-one tool: 18 mm and 55 mm. The 18 mm is best for wide angle photos like that of landscapes, skyscrapers, and the environment. If you want to take images with a lot of details, go with the 55 mm as it is a short telephoto lens. This way, you can learn how to use different focal lengths to your advantage. When you learn the characteristics of these focal lengths, your photos will automatically improve. You can also try out the focal lengths in between. There is a lot of room for experimenting which is ideal for beginners to learn at their own pace. Kit lenses have some useful features too, like image stabilizers, which are also known as vibration reduction on some camera models. This feature allows you to take photos at a slower shutter speed, and this is especially great for taking images in low light. Usually, the trajectory of lenses after the kit lens starts with a 50 mm prime lens. It is definitely better than a kit lens, and it is also affordable. A prime lens performs best at one focal length; therefore, a lot of time and effort goes into its making. What are the Disadvantages of Using a Kit Lens? Now that you know what is a kit lens and how it can help you as a beginner, let’s find out what its shortcomings are and why professionals do not use it as much. Definitely, it is a decent lens but it has its limitations and once you start to get better at taking photos you will realize that. The 18mm focal length is still not wide enough, and you may need an even smaller focal length for a wide-angle view and to fit in more into the view field. Similarly, the 55mm lens may not get you as close to what you are trying to focus on. The autofocus is also slower when using kit lenses. On better lenses, the autofocus is fast and has no noise. Kit lenses also don’t have a wide maximum aperture, which is mainly because of the associated costs. With that said, the maximum aperture is f/5.6 which may not be enough in some cases. Lastly, it does not have a high-quality make. Expensive lenses are a lot more rugged and durable as they are made from metal and have weatherproofing. With all the information given above, you should still use the kit lens as much as you can for you to learn the basic techniques. You will know yourself when you are ready for a better lens. Hence, it would not be wrong to say that the kit lens is of great value. In a word, it is your key to the world of photography, and everything necessary is already built in to get a great quality image and help you with your creative growth.